Bring a pot of water to a boil and cook the ramen noodles for 3 minutes. Drain and rinse with cold water. Toss with teaspoon of vegetable oil in a small bowl, set aside. In a small bowl mix together ketchup, sriracha, Worcestershire sauce, soy sauce and honey, set aside. Make sure everything else is prepped before you move on. 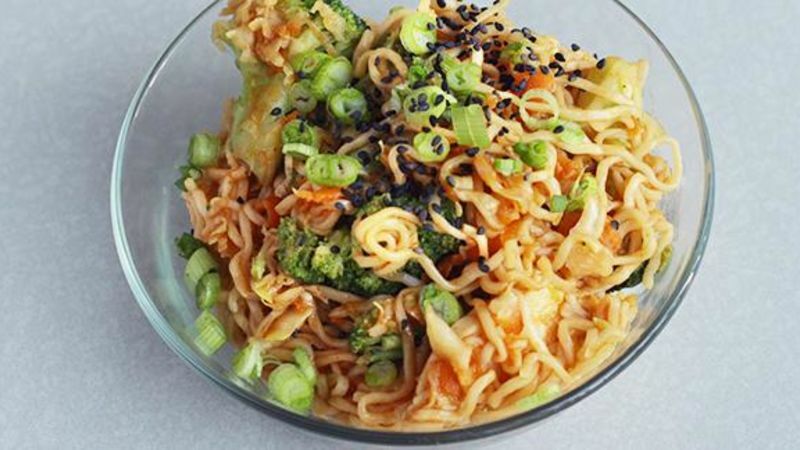 Place broccoli floret in microwave, according to directions on package, and steam for 5 min. Preheat a large skillet on high heat and add vegetable oil and ginger, cook for approx 1 min, stirring to make sure ginger doesn’t burn. 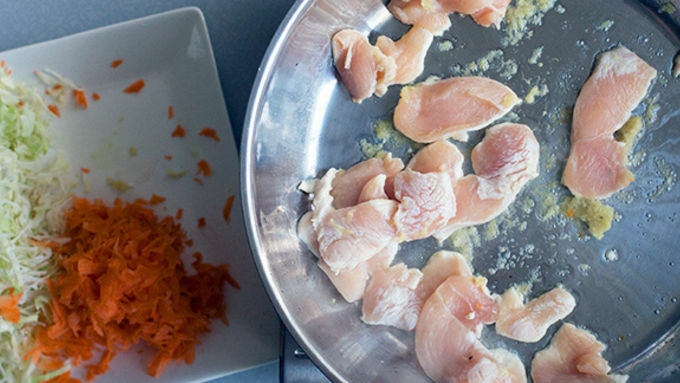 Add chicken and sauté until just cooked through. Add in the cabbage and carrot and cook until it just barely starts to wilt, about 1 minute. Add in the noodles, broccoli, and sauce and cook until heated through. Serve with sliced green onion and black sesame seeds or toasted regular sesame seeds. Short on cash after Christmas and looking to be a bit more frugal with food? Enter Yakisoba. There’s everything you could want in this dish, and it’s inexpensive enough that you can have it approximately every single day!For the ingredients: This dish comes together fast, and it’s important that’s nothing is overcooked so prep for everything is done ahead of time. That includes cooking the noodles. 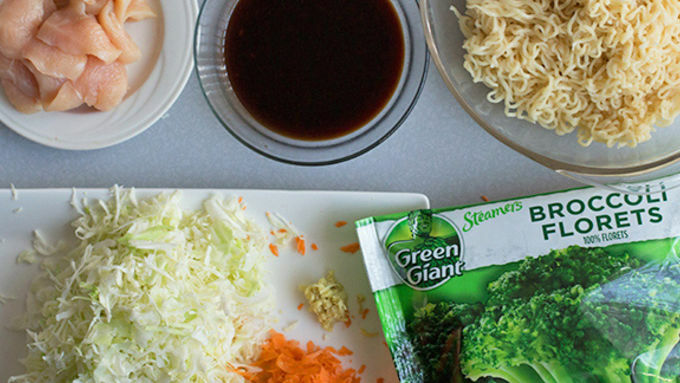 So almost everything here is prepped with the exception of the Green Giant broccoli florets – they steam in the microwave real quick. 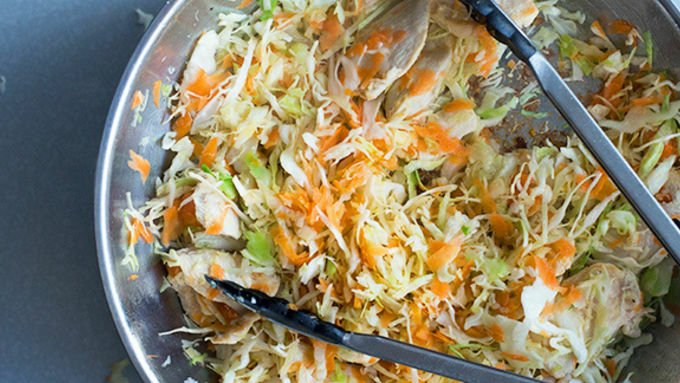 We’re adding in the veggie power of fresh cabbage and carrots. There’s some chicken, grated ginger, a sauce made of a few different things, and ramen noodles that we’ve cooked, shocked in cold water, and tossed with some oil. Once the Yakisoba is heated through, serve it up! Some sliced green onions add a little more flavor and black sesame seeds add a little crunch and flair. And food flair is a thing.